The bio of Richard Cope | Launceston Then! In June 1800 a number of young men passed their college examinations which entitled them to become preachers of the gospel; at that time each student, at the end of his last term was sent to a chosen place to preach for six weeks before being given a post. One young man was directed to Launceston, of which he had heard, and on being given his orders demurred, saying that he had heard bad things regarding the arguments and unrest at that place. His Tutor said that he was chosen specially because of this as the tutor believed that he was a man of peace and could bring tranquility to this area of unrest. This young man, Richard Cope born in 1776 in Regent street, London, agreed to go for six weeks and arrived in Launceston on 27th June, 1800, and preached his first sermon on Sunday 28th June, at the Congregational Chapel in Castle Street. He was then, in July, requested by the congregation to stay for 12 months, to which he agreed. The Reverend Cope now decided he liked the town so much he decided to remain longer, his congregation had swollen from around 200 to over 600 and he had to enlarge the area of his preaching to the outlying villages. The reverend gentleman took to preaching the gospel at South Petherwin, Truscott, Egloskerry, Yeolmbridge, Langdon, Tamartown, Polyphant, Holsworthy, Lawhitton, Bennacott, Northcot Hamlet, Boyton and Tamerton. He also held services in Callington at the request of the incumbent, the Rev James Messenger. This helped to bring his mind to bear on marriage and in July 1801, Rev Cope decided he could afford a wife and he was wed to Miss Davies, a member of the church in Chapel Street, Soho, London, by the Reverend J Maddy, the curate, in St James’ church, Piccadilly. Due mainly to his visiting the local villages and preaching there he was now requested by several people to teach their children and to supplement a preacher’s pay he set up a school and took in boarders, his first school being in Westgate Street. As well as townsfolk people like the Rev John Russell of Southill, James Morgan, esq., of Woodovis and Mrs Hooper of Appledore sent their sons to him for their educational training. 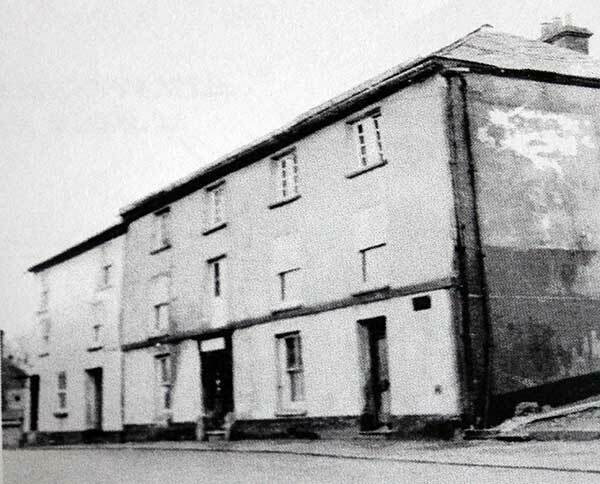 After the birth of a daughter in July 1802, his house became too small to accommodate his growing family and the school children and he rented a house in Castle Street from Colonel Lawrence (Lawrence House, since 1964 the Town Museum). The school and family moved in on Monday, 19th December, 1803. Within eleven years his family consisted of five sons and two daughters. (Eldest son Thomas Wilson died in Dublin April 9th, 1822 at the age of 18 years, Emily married Mr James Hiley Morgan of Abergavenny and died February 11th, 1844, aged 41, Edward Leigh died at Launceston September 10th, 1850, aged 44). Belle Vue House, Westgate Street. Cope’s happy school soon became too big for Lawrence House and they moved back to Westgate Street around 1813, this time into the newly built Westgate Terrace, built on the site of a rather notorious ‘Lodging House’. The house was formerly the property of Mr Robert Watling. As his new school rapidly grew Mr Cope was again forced to move to bigger accommodation, this time only next door into Belle Vue House (above), on the site of which had stood the Half Moon (Belle Vue House was taken down in 1957 so that the Fire Station could be built on the site). From among his numerous pupils 16 became ministers of the gospel, several were dissenting ministers and several others became well known personalities. On 28th July, 1815, The Reverend James Cope, brother of Richard, was ordained at Weytown, Dorset. June 24th, 1820.- the Rev R Cope, AM., gave in his resignation to this church, having filled the ministerial office over us twenty years as a faithful pastor, during which time the chapel was enlarged three times and the congregation continued to increase! He was made very useful in the conversion of sinners and in building up the church of the living God. He left us to fill a more important station in the church of God as Tutor at an academy in Ireland. From 1820 to 1822 Richard filled the post of tutor in the Irish Evangelical College, Manor Street, Dublin; but the appointment proved unsatisfactory. Cope returned to preaching. He was minister of Salem Chapel, Wakefield, from 1822 to 1829; of Quebec Chapel, Abergavenny, from 1829 to 1836; and of New Street Independent Chapel at Penryn, in Cornwall, from April 1836 until his death. In 1856. Cope died at Penryn on 26 October 1856, and was buried on 31 October in the (now disused) Congregationalist Cemetery at Ponsharden, in Falmouth, Cornwall.